I am staring at him right now. 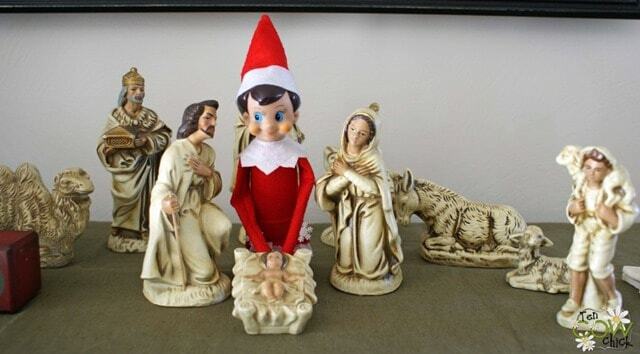 That darn elf on a shelf. We named him Buddy. I know, how original right? Elf … the movie? Will Ferrell? This morning he’s hanging sideways above me from a decorative wall-piece, well out of the reach of any preschooler who might reach up to grab him. My job is simple: every morning I have to move Buddy to a different spot in the house so he can spy on the boys during the day and report back to Santa at night. Of course there was that one day when I totally neglected my responsibilities of moving Buddy. My youngest wasn’t even fazed when he found him. He just assumed Buddy wasn’t original that day. There are times when my wife and I look at each other and ask ourselves what the heck we are doing. Are we placing too much emphasis on the whole Santa thing? Are we neglecting the true meaning of Christmas in favor of pop culture? Now, let me get things straight. First of all, I am very basic with where I position Buddy. I don’t do those extravagant things that you might see on Facebook or Pinetrist where Buddy is hanging from a zip line, smiling, waiting to slide down into an awaiting bowl of Cheerios. Secondly, what is the harm in having a little fun? The boys love Buddy! Finally, they do know that they love someone else even more. Someone who we should be celebrating a bit more than Santa. A year ago my wife created an ABC book for our boys. She took every letter of the alphabet and incorporated a part of the Christmas story. We do a letter a day starting November 29 and finish up on Christmas Day. She tried to get a little bit of everything in the story, from Jesus’ bloodline (“O” is for Obed and “D” is for David), to the setting (“B” is for Bethlehem and “I” is for inn), to the characters (“H” is for Herod and “J” is for Joseph). Each day has a short paragraph to read about the topic, a scripture, and a colorful picture for the boys to connect the meaning. I joyfully admit that as much as they love Buddy the elf, my boys love reading their advent devotion book even more. As we approach the light at the end of the tunnel—which for me is at 3:10 pm Friday afternoon—ask yourselves the question of how you are celebrating this holiday season with your family? Are you focused on the baby in the manger or the gifts? The significance of His birth or Santa? An advent devotion book or Buddy the elf? Truthfully, we could insert a lot of things at the end there: Black Friday, egg nog, Rudolph, gingerbread house-making parties, and ugly Christmas sweater parties. These things are not necessarily wrong to do. Sometimes they actually can reward you with fellowship and fun! However, if you are not complementing your time with meaningful Christmas activities that bring glory to the King of Kings, your family will become lost. All this being said, how do you celebrate the true meaning of Christmas? Do you have a tradition in your family that you’d like to share with other readers? Reply below! Tell us what you do. Maybe you make cupcakes for Jesus’ birthday and sing Happy Birthday to Him. Maybe your family sings Christmas carols in your neighborhood. Maybe you give gifts of faith to your children on Christmas Day. Whatever it may be, I would love to hear about it. “For today in the city of David there has been born for you a Savior, who is Christ the Lord” (Luke 2: 11). Christian teachers, please know your job of teaching actually continues over the holiday break. Teach your family and friends about the meaning of that scripture above. Don’t become lost in worldly activities. Focus your attention on the birth of Jesus. Alright, I need to get ready for work. And move Buddy the elf to the ceiling fan chord.